Rebus is an exquisite book. Large format, trimmed pages with red edges, 240 pages thick. 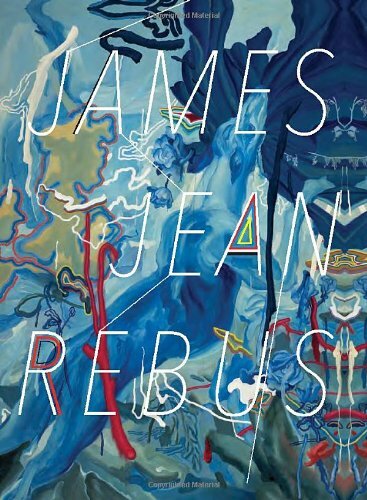 Rebus is a collection of James Jean's personal and commercial paintings from 2001 to 2011. In 2001, he was 21 and had just graduated from art school. This book is very impressive considering how much he has achieved over the last 10 years. Some of his work which appeared in other publications are also collected here. There are Fables covers or his life sketches. There isn't much duplication overall. There are work from his Kindling exhibition. Some of them have appeared in the similarly titled poster-book Kindling. There are his personal works, commissioned work from Prada, the panorama illustrations that appeared in the accordion book Rift. You might have seen them on his website, some are published in the book for the first time. The illustrations are beautiful, haunting and inspiring at the same time. It's surrealism that's uniquely James Jean. These images are best seen than described. There are also some photos from his exhibition. I only have one minor quibble and that's regarding the presentation of his panorama illustrations that span 8 pages. They aren't printed as gatefold pages which is the more appropriate way to present them, and possibly the best way they should be seen. Rebus is an enthralling collection. Highly recommended for any James Jean fan. very interesting photos shared. I am very happy to read this article. Thanks for giving more information about Rebus . Fantastic walk-through. I appreciate this post. "with the exception of his work for Fables and his sketches"
Can anyone say wich fables works are here ? There is nothing on Fables inside. Mine's bought from Amazon UK. Damage from shipping has got to do with luck. You can try getting from Amazon US — probably shipped in a box or flat cardboard parcel. Book Depository should be alright as well since you're getting one book, they are going to put it in a padded envelope or a flat cardboard parcel. do you know the differences between the "Rebus" reviewed and this one edited in France ? (Obviously, the cover is different and the text has probably been translate in French, but do you know if the illustrations are still the same, if there are bonuses...). I forgot to post the link. If you're know French, you can get that edition. The content should be the same. I have stopped buying books through amazon (UK) and (US). I live in new zealand and EVERY time i purchase books through them they arrive in a box that is damaged and the books have busted corners and to return the books costs me greatly as amazon always wants the books returned or else you have to pay twice..